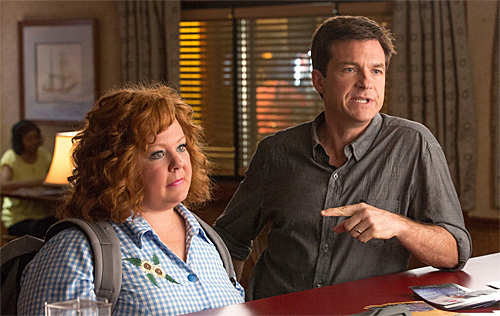 Sandy Patterson (Jason Bateman) receives a call from a woman (Melissa McCarthy) who claims to be from fraud detection. Offering free services to protect his identity, Sandy gives the caller his full name, date of birth, and social security number. Before the guy knows it, his credit card is maxed out and there is a warrant for his arrest. Meanwhile, Diana has a ball shopping for clothes, buying a car, and getting her hair done. The authorities are aware that Sandy’s identity has been stolen, but they are unable to arrest the perpetrator given that she lives across the country. Sandy has a plan: in a span of a week, somehow he will persuade Diana to come with him to Colorado and trick her into confessing her crimes while the cops eavesdrop. It is a shame that “Identity Thief,” based on the screenplay by Craig Mazin and directed by Seth Gordon, is made all the more complicated by introducing gangsters (T.I., Genesis Rodriguez) and a bounty hunter (Robert Patrick) into the mix when it should have been clean and to the point: two people who cannot stand each other driving across America and learning a little bit about each other. By introducing unnecessary action sequences, what is communicated is the writer’s lack of confidence to his material. Or perhaps it is the writer’s intention to make the script more appealing to the audience. Whichever the case, it holds back a movie that should have been better than the final product. Prior to the introduction of the threat of violence, the comedy is consistently entertaining. I enjoyed watching Sandy being so blissfully oblivious of the fact that someone has been using his name and causing all sorts of trouble in Florida. Sandy going on shopping sprees, carrying least five bags in one hand, are equally funny. Bateman and McCarthy have something in common: they can stand in one spot doing nothing and I want to laugh. Casting two leads who possess effortless charm is smart. One plays a pushover and the other plays a parasite. Their comedic styles are opposite. Bateman downplays the humor in his character: Sandy’s personality is sarcastic but he is almost shy about it, concerned about stepping on someone’s toes. McCarthy, on the other hand, makes a fiesta out of everything, from physical gags to obnoxious lines: Diana is big and colorful but, like so many people who are constantly in-your-face, maybe it is a way of hiding something that is painful. I had fun with their chemistry. The people on the hunt for Diana and Sandy are played straight, almost boring. When the picture cuts to them, I wanted to get up and get a glass of water. They are written so flavorless, so devoid of humor that they could have been taken from any action picture. You know, the henchmen who would probably have been shot by the hero within the first five minutes. Wouldn’t it have been great, for instance, if the pair of gangsters were allowed to be as funny as the protagonists? That way, when the camera is on them, the story will not feel like it drags. T.I. and Rodriguez are not to blame. Rather, they are not given a script they can work with and creative direction to really make their characters pop. And how about those car chases? They are poorly choreographed. I can watch children playing with their toy cars and observe more creativity. Are the car crashes supposed to be exciting? Funny? No, I think they are simply there to eat time. I liked “Identity Thief,” but only the parts where Bateman and McCarthy are in it: their characters just talking, hitting each other with guitars, and pulling each other’s hair. What the screenplay fails to understand is that the best comedies, especially those that involve a road trip, are simple. Instead, we are presented a bloated, tired thing. Good review Franz. Just did not make me laugh, no matter how hard it tried to. The only one in this slew of funny people that actually had me laughing was T.I. Yes, T.I. the rapper. I don’t know much about T.I. (other than he’s a rapper), but I wasn’t amused by the character he played at all. The whole gangster subplot just felt out of place, an awkward appendage to make the movie more commercial.